One of my little Arabidopsis seedlings appears to be a mutant! Out of the hundreds of seeds I have sown so far, one has germinated into a spindly specimen with curiously lobed leaves. This is a little unexpected, as my seed are all a 'wild type' genome. When a lab wants to identify new genes involved with a certain process ( e.g. Shoot development, drought resistance, defence against pathogens), the seed are treated with chemical agents or radiation that induces changes in the DNA. If the change is severe enough, the gene may become inactive. The seed is then germinated and the seedlings screend to identify any aberrant phenotypes. If a gene required for pathogen resistance is mutated, for instance, the resulting seedling may show greater susceptibility to nasty fungi or bacteria. The mutant can then be used to identify and clone the gene in question. But I shouldn't have any mutants! My seed didn't undergo any hideous treatment, so this must be one of those 'random mutagenesis' events which my undergraduate lecturers assured us do happen sometimes, and which from the basis of Darwin's theory if natural selection. It is part of what makes working in living organisms so interesting; there is always a degree of 'randomness' thrown into the mix. This can get a little frustrating, however, when it comes to performing statistical analyses and your data is skewed by one or two ridiculous outliers which clearly aren't 'normal'! As this little plant is clearly an oddity, I can't use it for my experiments but I did enquire in a lab working in shoot development in the department if they might be interested. 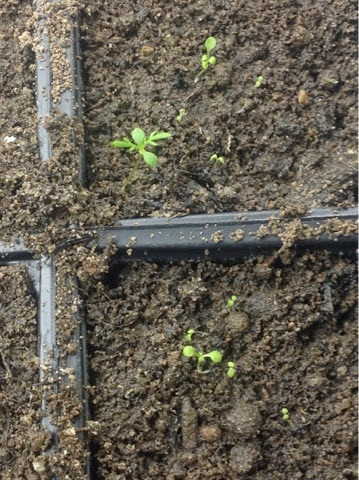 They seemed curious, but I was warned that the seedling probably wouldn't survive if may even 'grow out of' the phenotype. Indeed, since this photo was taken, my little mutant has indeed got progressively worse. The hypocotyl ( the stem of a seedling ) grew so long and spindly that it fell over and it has only weakened since then. But at least it served as a reminder that you can never take anything for granted in biology - who knows what will turn up?